Ice skating is a great way to get into the holiday spirit and include great additions to family outings! There are a few places around the Puget Sound to go! The first one is the rink that is part of Seattle’s Winterfest. The ice rink is right in the center of the Seattle Center at Fisher Pavillion, with floor to ceiling windows, it allows for a great view of the fountain while you skate! Starting November 23rd – January 6th, (exceptions to holidays), adults: $7, children 6 – 12: $5, and under 5: $2. This is CASH ONLY, so be sure to come prepared; cost does include skate rental. 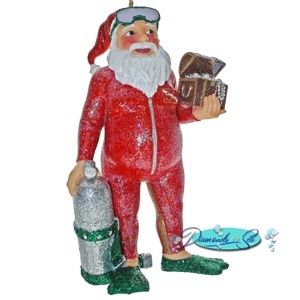 Go a little further south to the Tacoma Art Museum for the 3rd annual Franciscan Polar Plaza! Starting November 22nd – January 12th. 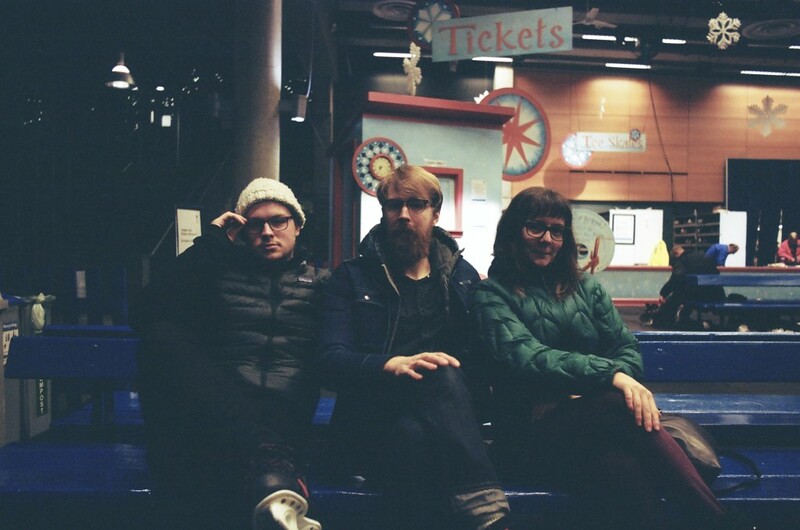 Make an outing of it and enjoy the art museum before making figure 8’s out on the ice! Adults: $8 & Children under 5: $4, Skate Rental: $2. They have special events going on throughout the season, so check out their web page! Bellevue has a great outdoor skating arena in the downtown park, with sweeping views of downtown and specials events all throughout the season! Starting November 29th – January 12th, Adults:$12, Children 6 and under $8, includes skate rentals. Checkout the website for all the details! 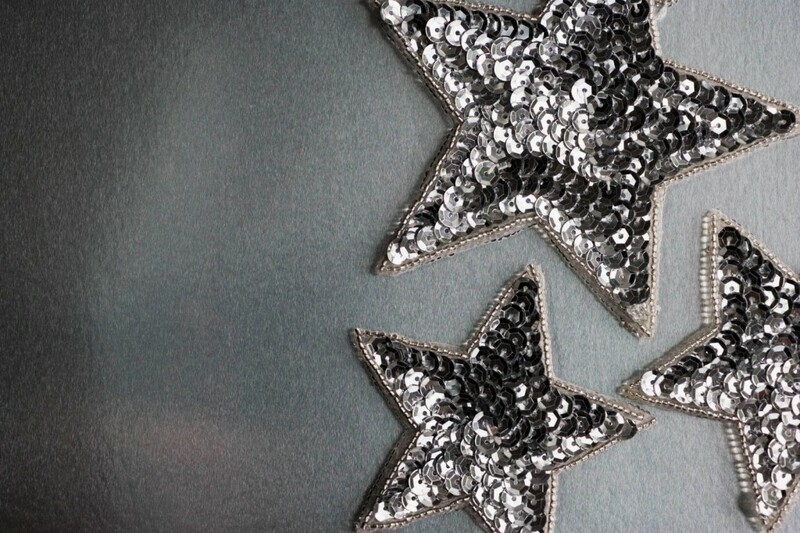 Bellevue has had a tradition that is well received every year by both children and parents! With falling snow, LIVE Toy Drummers, and dancing snow characters, how could this put any scrooge in the holiday spirit?! 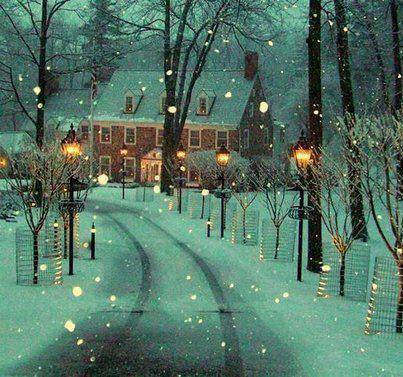 This event will happen nightly starting at 7pm, from November 29th – Christmas Eve. 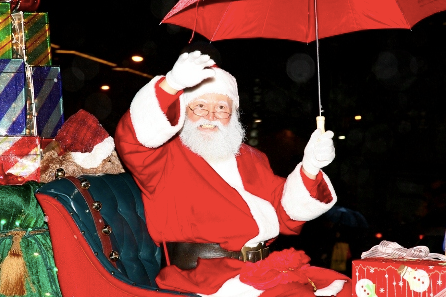 For one special night, Friday November 29th, Santa will make his appearance in the parade to kick-off the holiday season! After the parade he will also lead the Tree Lighting Ceremony. Santa is going to light a 30 ft tree at Bellevue Place’s Wintergarden! After the festivities, get your picture taken with all of the Snowflake Lane characters, and enjoy snacks and holiday tunes. Be sure NOT to miss all the action! Check out the website for details on parking, parade map, and times. All the festivities are held outdoors on the sidewalks between Bellevue Square and Lincoln Square, so be sure to grab a cup of hot chocolate and bundle up! This NW winter weather can be chilly (and that’s coming from someone who lives way way up North)! There will be live performances from the high-energy snowstorm, and ladies, a chance to get your very own photo with a princess! Enjoy a holiday experience this year at Bellevue Square! And remember, Santa is watching. Who’s Your Holidate at U Village? This year the Seattle Ronald McDonald House will benefit through U Village’s Holidate Event! Spend $25 on a ticket, proceeds benefit Seattle Ronald McDonald House, and receive many excellent perks around the shopping center with purchase of ticket! Perks include: discounts at participating stores, free goodies at Piatti’s, and the chance to win raffle prizes! You can also purchase a VIP ticket for $50 which will get you some exclusive perks and an extra raffle ticket, but act fast because there will only be 50 VIP tickets to be purchased! Also, be sure to stop by and see Santa! He’ll be in his cabin near Fran’s Chocolate from 9 AM – 8 PM on Holidate! You can get your photo taken with him. 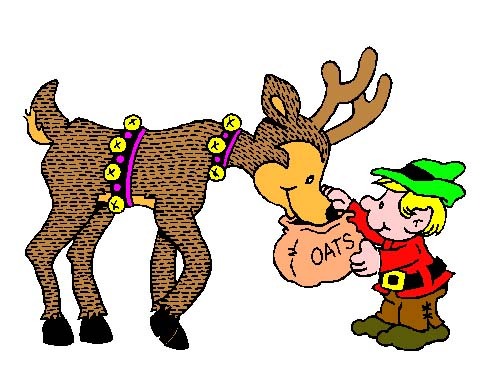 Special days benefit certain organizations, so check out the website or just stop by to say Merry Christmas and tell Santa all your season’s wishes! Deck the Halls in the Northwest! 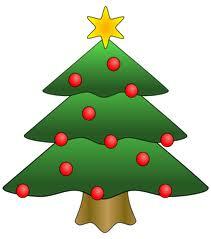 How do all of you get your Christmas Trees around the Pacific Northwest? I know there are a variety of ways and traditions. In the North Pole, elves march out into the snow, in hunt for the best lookin’ tree! First-things-first, I always check to make sure there are no critters inhabiting my future Christmas tree, and then I assess the branches making sure they are full and vibrant, and the last thing I do is check the trunk to be sure there is no rotting. I know that the Northwest has many mountains and I have heard that the Mountain Loop highway is a big Christmas tree hunting area. Just stop at the Verlot Ranger Station to purchase your tree permit of $10, then they’ll tell you where to go! 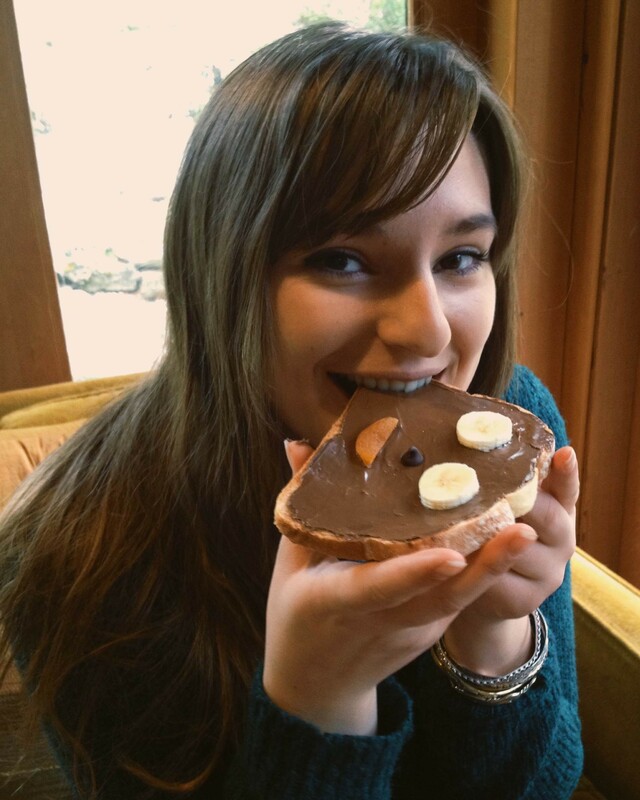 Many people make a tradition of going down to the tree lots – a tasty opportunity to get some hot chocolate. Don’t forget to bring your camera for lasting memories! As for decorating the tree, I love putting cards I receive onto the branches, tying bows on the branches, and collecting vintage ornaments found at thrift stores and antique stores! 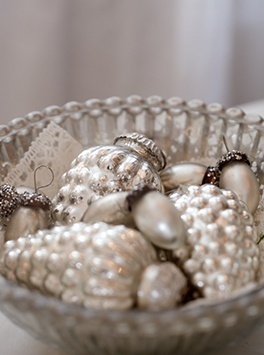 Share with your friends about how you decorate and get your tree, maybe you can get some ideas to add into your traditions! Whisk flour, baking soda, and salt together in a bowl and set aside. Beat until creamy the butter, peanut butter, sugar, and brown sugar. Add in the egg and vanilla and beat again until creamy. Add the flour mixture 1/2 cup at a time and mix until combined. Spoon out the cookie mixture and roll in you hand. Press slightly flat onto cookie sheet and pinch one end (for the nose). 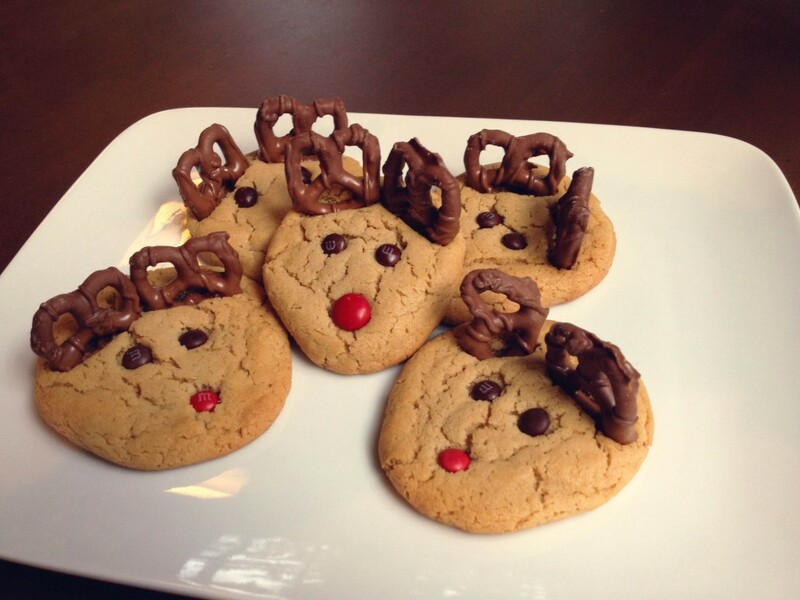 Right when they come out of the oven lightly press two pretzels for antlers, one large red M&M for a nose, and two mini brown M&M’s for eyes. Let set, and then enjoy! This holiday season The Fairmont Olympic Hotel in Downtown Seattle will be featuring 21 designer trees on display throughout the hotel! The opening night dinner gala kicks off the installment on Saturday November 23, benefitting Seattle Children’s Autism Center and Uncompensated Care at Seattle Children’s Hospital. For the public, the trees will be on display Sunday, November 24th – December 2nd, and there will be other ways to give-back to Seattle Children’s, and The Festival of Trees. You can purchase a tree to support Seattle Children’s, or there will be aTree Raffle for the designer trees throughout the hotel on Sunday, November 24th. Again, proceeds benefit Seattle Children’s Autism Center and Uncompensated Care at Seattle Children’s Hospital! There are ways to donate to the event itself: The Festival of Trees, that are fun and easy. One way is to dine in the very elegant Georgian Room November 23rd – January 3rd, and order off the menu designed for The Festival of Trees; a portion of your bill will support the event. Also, during this time, 10% of your room cost will go toward supporting this event! 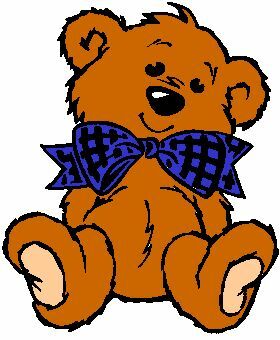 The Festival of Trees is not the only event going on in this bustling downtown hotel, there is also the annual Teddy Bear Suite that is fun for everyone! Starting Sunday November 24th, open Monday – Thursday 11 am – 5 pm & Friday – Sunday (and Christmas) 10 am – 7 pm throughout the season. This magical room, designed by Kevin Bradford, is great for family photos and to just wander around and become enchanted within this holiday world! 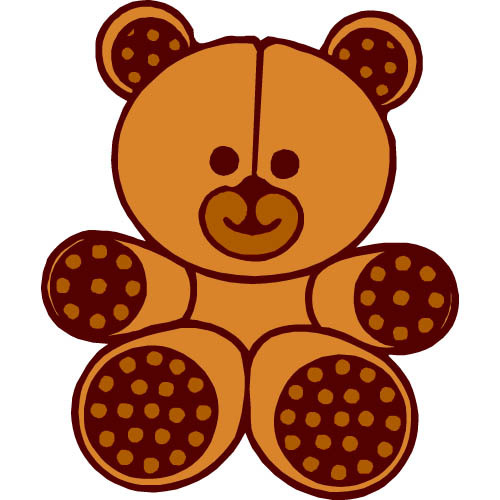 Donations are taken at the suite that benefit Uncompensated Care at Seattle Children’s Hospital. Ho, Ho, Ho, Holiday Lights in the Puget Sound! 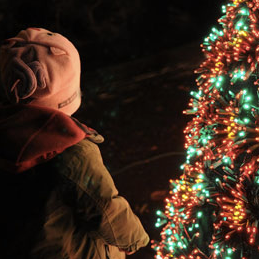 There are a few places to go see some fabulous lights around the Puget Sound! Bring the kiddos, a thermos of hot cocoa, and a bright cheery mood! The first outing I would like to share with you is within the city of Seattle at the Woodland Park Zoo. Wildlights is the name of the event, open November 29th, 2013 – January 4th, 2014; 5:30 PM – 8:30 PM. They feature impressive light displays both inside and out, have special reindeer guests, and you can have a snowball fight! Tickets are under $10 and they also have an ongoing photo contest for the holiday season. So bring your friends and family, and your camera! Visit the Wildlights website! If you inhabit the south end of the Puget Sound, no worries there is a closer light show to you! At the Point Defiance Zoo they put on a pretty good show; with a scuba diving Santa and a carousel. Tickets are cheaper for members, but check out the Zoolights Website for prices and scuba Santa times! Check out the Point Defiance Zoo November 29th – January 5th! Mrs. Claus brought us elves some fantastic snacks today! 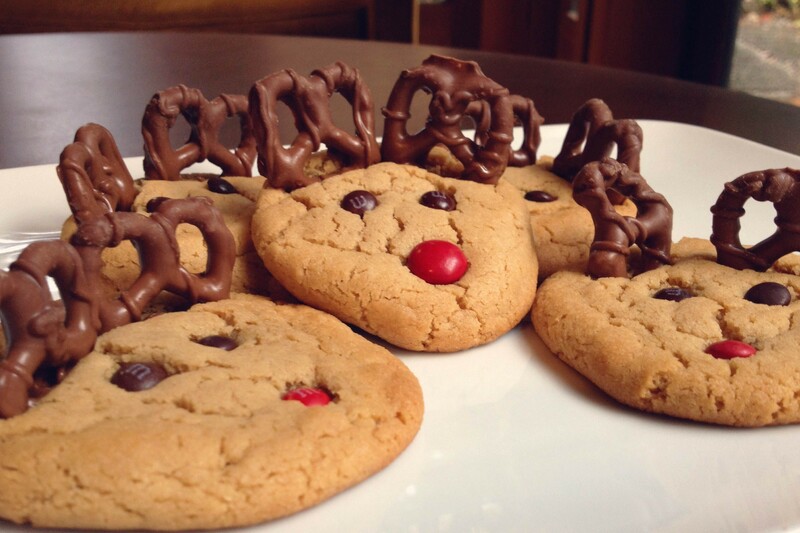 As it is getting busier around the North Pole with Christmas nearing, Mrs. Claus tries to keep us full and energized by making some fun-to-eat snacks! Sometimes she makes individualized ones, or just platters to share, all are yummy and fun finger-food. Both of these recipes can be easily interpreted to make another object, animal, or setting. So get to cooking, and get creative! Step 1: Take two pieces of bread and lay them side-by-side. 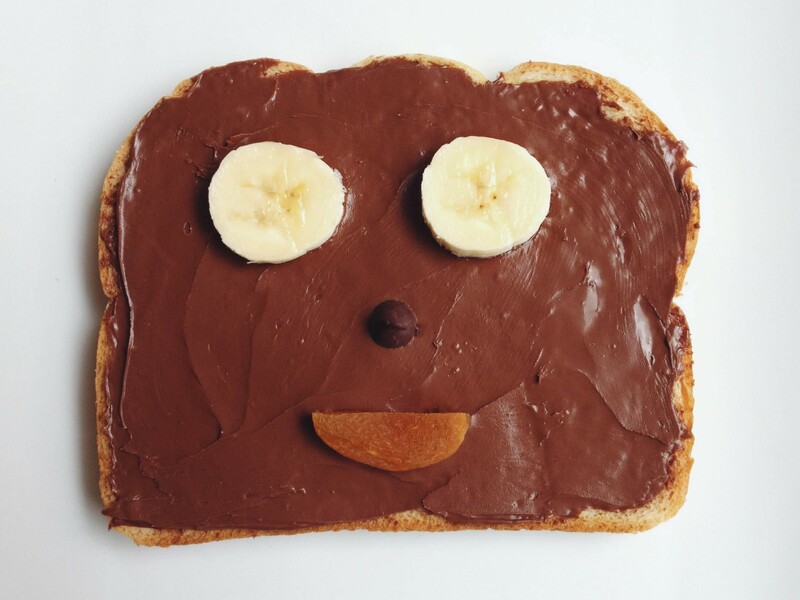 Spread thick, and smooth on one piece creamy peanut butter, and on the other nutella. Step 2 : Open a banana and slice 4 small pieces, put those in the place of the eyes, and place a chocolate chip for the nose. Step 3: Cut a dried apricot in half length-wise, use one half as the smiling mouth. 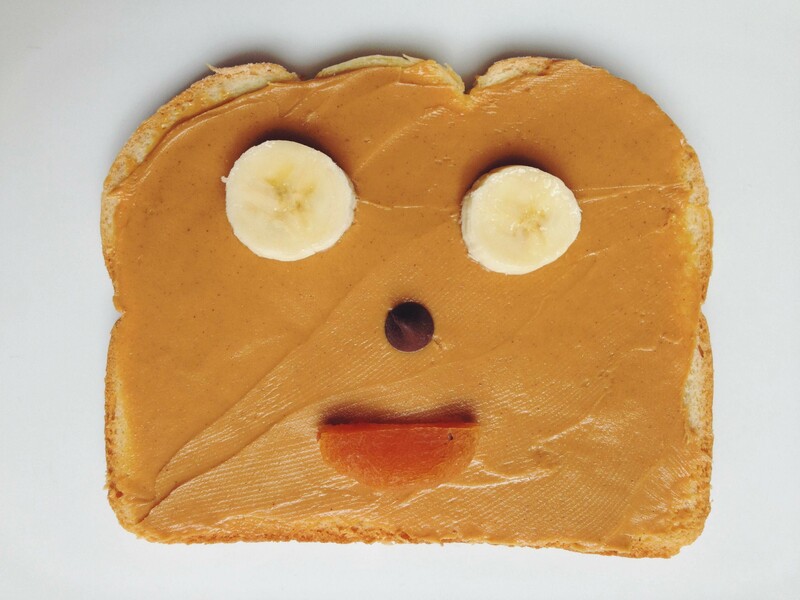 Even Big Kids enjoy this snack! 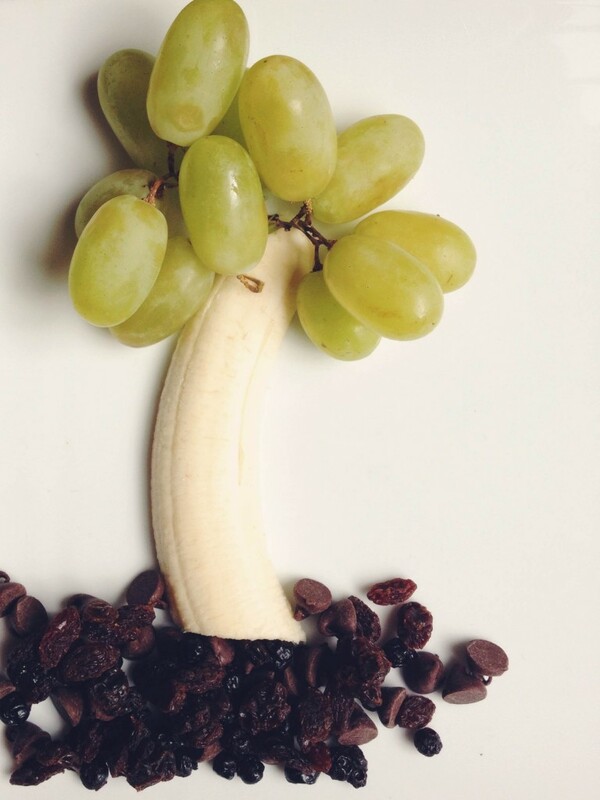 Step 1: Create the Palm Trees: Cut a banana in half, length-wise, and place on the platter; one half on each side. Cut the bottom of the banana to even it out. Grab a few green grape bunches and place accordingly on top of the banana. Step 2: Create the Ground: Evenly sprinkle chocolate chips, dried blueberries, and raisins along the bottom of the bananas. Step 3: Create the Man: Cut four slices of ham for limbs (Mrs. Claus used ham steak for nice thick ham), and one square piece (about a square inch), for the body. Cut a square piece of cheese for the head. 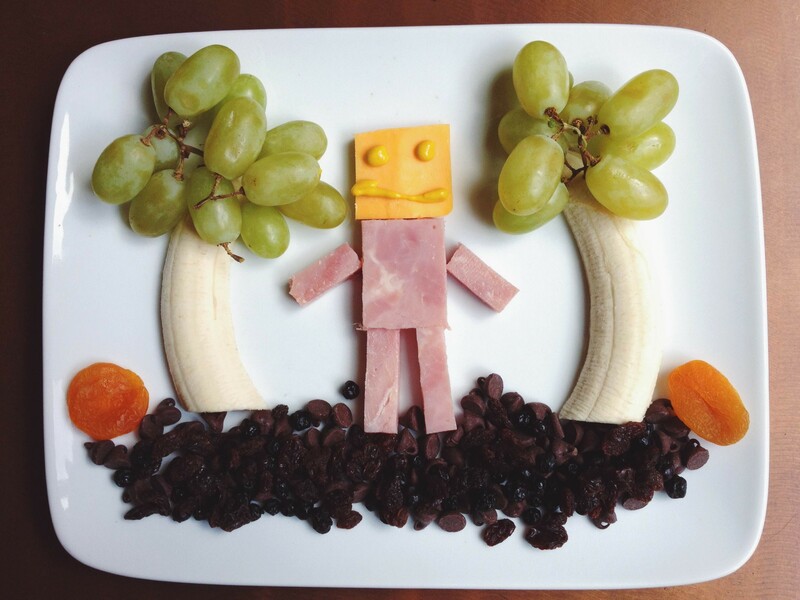 Assemble the body, two longer slices of ham for the legs, the shorter for the arms, and cheese for the head. Use yellow mustard to create a face! Step 4: Enjoy by sharing! Both of these recipes can be made with just a butter knife so you can easily include the kids! Kids, you don’t have to stick to the recipes exactly. If you don’t like raisins use peanuts, M&Ms, pretzels, or anything you think would look good as a ground! And if you’re a vegetarian, just make the body out of cheese. Get creative and have fun! Challenge your self and see what other animals or settings you can come up with! I’ve been stewing with ideas on ways to make a Thanksgiving table-setting more flavorful, and I have found some exciting things for both youngsters and parents! All you kiddos out there: how many of you become undeniably bored after you’ve finished your turkey, and you’re forced to sit at the table, listening to the adults ramble on about their new countertops in the kitchen? Well I’ve found a way for you to enjoy your time at the table (or moms this will also be great for that uncle who would rather play with the kids)! These interactive utensil holders that I found on theidearoom.net, are a great way to make the table look clean, and provide an after-dinner activity! Simply print, glue or sew together (depending on the paper you print on to), then put out some crayons, markers, and/or pencils in the middle of the kids table in a funky glass; enjoy! 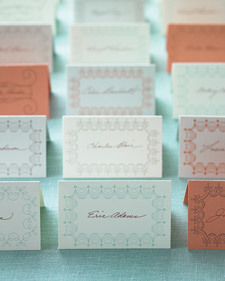 Some fun ways to seat people are these (again printable) place cards I found on marthastewartweddings.com. The colored printout I think is the best because it has a fall color scheme, although, if you would like to remain simple and uniform, they have options for black and grey! 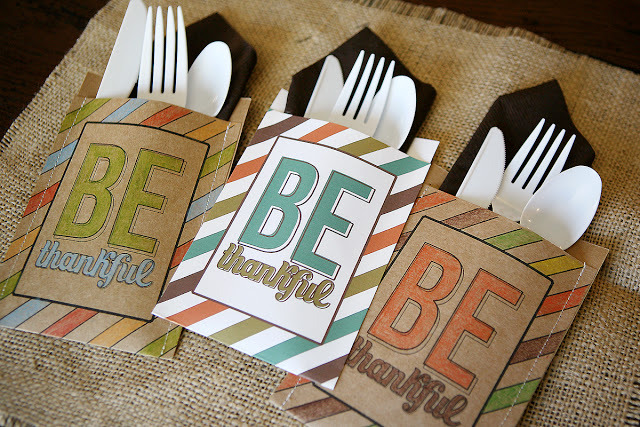 Kids, you could help your mom by folding these place cards in half as neatly as you can, and practice your best handwriting to write your guests’ names.